The Computer Control High-Strength Bolt Torque Coefficient Testing Machine is composed of a loading system, a transmission system, a digital data acquisition and processing system, and a computer measurement control display system. 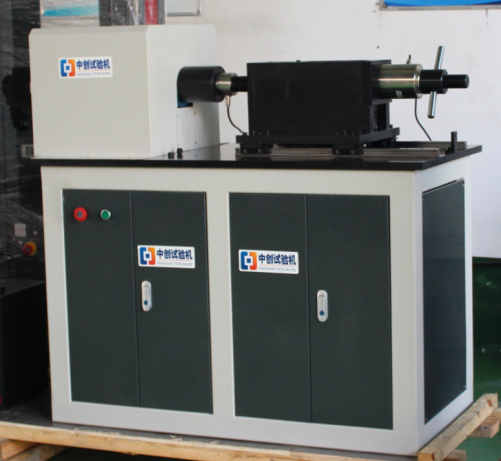 Computer Control High-Strength Bolt Torque Coefficient Testing Machine is suitable for torsion-tensile mechanical properties of high-strength bolts and large hexagon bolts. Test, can measure the torque, maximum torque, torsion angle, torque coefficient, axial tensile force, torsion force, torque-torsion angle and other technical indicators, and has a torque-axial force-torsion angle curve. The Computer Control High-Strength Bolt Torque Coefficient Testing Machine adopts horizontal structure, computer software control, full digital data acquisition control system, motor, torque reducer drive, dynamic torsion sensor and axial sensor to detect torque and axial force, with uniform loading, stability, no impact, Accurate features of data acquisition control. Test and test function: Windows7 Chinese operating platform, to achieve a variety of control of torque, torsion angle, tension. Using the graphical operating system with graphical interface, the display screen and operation panel can be set; the test speed and various control parameters can be set; the basic test results can be displayed in real time; various relevant parameter graphs of the test process can be displayed in real time; Implement system diagnostics and display diagnostic results. The whole machine utilizes the all-digital data acquisition and processing system of the all-digital control system, and the photoelectric encoder collects the torsion angle of the sample.